At what point will we have road pricing? The current mix of toll roads and free roads in Melbourne doesn’t really make sense. For instance depending on trip source and destination, outside peak times it can be almost as fast to drive via King Street (free) as the Bolte Bridge ($2.97). Ditto Kings Way/Queens Road/Dandenong Road (free) compared to the Burnley Tunnel and Citylink to the Monash Freeway (an eye-watering $7.72). Ideally you want longer-distance/through trips on the motorways, but if the time advantage often isn’t there, there’s no incentive to use the tollways. What we have now is not a holistic approach; it’s not trying to achieve any particular traffic flow outcome. Instead, the toll fees are based on trying to recoup investment costs on a specific part of the network, from 20 years ago. The equivalent might be to build a new suburban train line and charge huge fares for that, while neighbouring lines were the regular $4.10 fare. It makes no sense in the context of the overall network. Fuel taxes now are based on the assumption that cars are powered by fossil fuels. While they don’t pay for the costs of roads, it’s better to have that revenue than not. If electric cars take over, that revenue stream will disappear. Often people will say you can’t impose road pricing or a congestion tax without first improving public transport. Fair point. But what does Success look like? What criteria do you use? Some train lines have doubled in frequency in the past 20 years. Some (at some times) have quadrupled in frequency. … Some are much the same. The CBD has mass transit in all directions, with many (out to Footscray, Clifton Hill, Burnley and as far as Ringwood at times, Dandenong and Frankston) providing trains every 10 minutes, 7 days a week. But people still need to be able to get onto trains; car parks will never be big enough, and outer-suburban connecting buses are mostly inadequate. It certainly needs to get better, but at some point you’re going to have to say it’s not an excuse anymore. Perhaps the opening of the metro rail tunnel in 2026 should be accompanied by a big boost in timetables for trains and connecting buses, becoming a catalyst for CBD road pricing? The London congestion charge is a reminder that road pricing can be flexible, and is not absolute. It’s a whopping £11.50 per day (slightly less if you set up “auto pay”), but importantly, it only applies on weekdays, and only from 7am to 6pm. There are numerous exclusions for local residents, taxis, motorbikes and others. Much of the money gets spent on public transport and other transport modes. The history of it shows it’s been a big success. Melbourne already has a “Congestion Levy”, applied to long stay/commuter car parking in Melbourne CBD and some inner suburbs. This is a disincentive to car commuters, but doesn’t affect through-traffic. 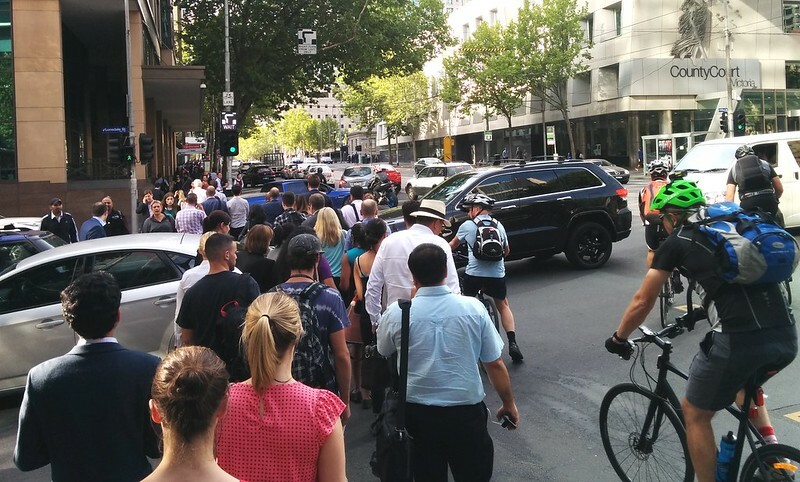 Partly due to a lack of traffic rule enforcement, CBD traffic is becoming an impediment to pedestrians/public transport users and to cyclists, but overall congestion also badly affects public transport and freight vehicles. Assuming there wouldn’t be the political will or the technology yet to have a complete road pricing scheme, could you set up eTag readers at strategic points to charge vehicles coming into the CBD? Do enough vehicles already have eTags? Or is simple number plate recognition better? Different prices at different times would be appropriate. Maximum charge at peak commuting times. Minimum or no charge in the middle of the night. Of course even the most obvious congestion pricing scheme is a political hot potato. So don’t hold your breath. I think originally the government of the day wanted the road tolls to be cheaper for off peak, but (surprise!) the toll company objected. It is absurd that it costs the same to travel from Richmond station to Flinder St as Cranborne to Flinder St (3km vs 40km). Less than one quarter of overall public transport costs are paid by users and this percentage is going down. Petrol taxes are collected (and used to fund operations) by the Federal govt whereas responsibility for PT and roads rests with state govt. My argument is that zone one service is good enough to do this to, zone two isn’t. So the charge is levied based on where you live. Furthermore, need to consider the equity effects hence another reason to go after those with the million dollar properties. “Of course even the most obvious congestion pricing scheme is a political hot potato. So don’t hold your breath.”. True, but the interesting lesson from London is that the congestion charge was introduced in 2003 by a very left-wing Labour Mayor, Ken Livingstone, against Conservative opposition and at the 2004 election Conservative policies included abolishing it. They lost, and it’s now an accepted thing. Sometimes fortune favours the brave! In a transport sense I agree with road pricing, but in the context of the Melbourne overall, I think there are serious issues to consider. Equity and access are big issues in Melbourne, and road pricing will further cement the divisions between the infrastructure-rich wealthy suburbs and the infrastructure and mobility-poor disadvantaged suburbs. It is no coincidence that all the train lines south of the Yarra provide a frequent service on weekdays. All the lines that have frequent evening and weekend services are south of the Yarra. The only areas with a grid of frequent tram services are, again, in the east and south-eastern suburbs. Only a single SmartBus service runs into the western suburbs, compared with nearly a dozen in the east. Most of these areas in the east and south-east have property prices that are out of reach for working class people for their entire lives. Yet, there is very little seeming to be done on the fundamental issues of access for the most disadvantaged areas. I think a road pricing plan has a side-effect of closing off much of the best parts of Melbourne from those who are living in the poorest, far-flung suburbs (and not by choice, because of the ridiculous property market) – whether through a cost, or a cost burden. The Metro Rail Tunnel is certainly no panacea. The business case lists services beyond West Footscray as running every 20 mins out of peak – which is atrocious. If the Frankston line ran every 20 mins beyond Armadale there would be a huge outcry, but for lines that serve less advantaged, politically-marginalised areas, it doesn’t matter. This seems to reflect more generally a trend by this government to not bother improving the actual train service. Plus, given how Labor’s timetabling is going, I don’t know if they would actually run any additional services after opening the Metro Tunnel. Perhaps for the Frankston line. Daniel, the issue is a political hot potato and one that will inevitably need to be dealt with whilst we continue to have and experience meaningful levels of population growth. It would certainly help if we could manage to obtain bipartisan political support for one transport plan for Victoria rather than revisit our strategic transport strategy every time we have a change in government. I think with the creation of Infrastructure Victoria, we are at least benefitting from an arms length identification of infrastructure project needs and priorities. I just hope that this issue receives an elevation in priority it deserves! Great thought provoking piece. I admire but don’t approve of Steven Fry’s hack for getting around the congestion charge – buy a London taxi! The tabloids will immediately dismiss any road pricing scheme as ‘revenue raising’, giving an opportunity for outrage and hysteria. The tricky thing is to be able to explain very quickly why you might want some users to pay more if it improves the functionality of the overall (i.e. not just private driving) transport network. Autonomous vehicles will be a game changer here. When we are no longer paying the fee directly ourselves, but we pay it included in the cost of the trip, we will be more inclined to accept the inevitable. In the short term, autonomous vehicles will be something for the wealthy, but with time, and when the “shared economy” catches up (aka flexicare meets uber), why will we pay for a private vehicle that sits idle for up to 23 hours a day when we can “rent” one on demand, if road pricing is “hidden” in the rental fee, it will be more palatable, and the technology will be simple as well (data like KMs traveled in predetermined zones, entry and exits to such zones will all be automated when we start using autonomous vehicles, no need for “e-tags” or detectors – “big brother” will be watching…)…. @Adam, some parts of zone 1 have very good public transport, but some (especially outside the tram suburbs) have few options for local and cross-suburban trips. Example: Caulfield to Glen Iris/Gardiner. There are numerous routes in this area, but only one nearby in a north-south alignment connecting them, and it’s an infrequent bus (which doesn’t actually serve Glen Iris; it goes to Tooronga). @Campbell, my view is that the rail lines to the south and east have the most frequent service because they are (mostly*) the longest lines. Longer lines = more stations = more ridership, and high frequency provision is driven far more by crowding than by wanting to cut waiting times. Longer lines have of course occurred because development has spread the farthest in those directions. *Sure, the short lines to Sandringham and Glen Waverley run every 15 minutes, which is better than most of the north/west lines. But it’s only the long lines to Frankston, Dandenong and Ringwood which have 10 minute off-peak/weekend services. @Nick, this podcast with Sam Schwartz (one of the guys who invented the term “gridlock”) talks about the campaign for road pricing in New York City. He talks about how getting consensus meant coming up with a scheme that increased costs in the most congested areas, with some of that money funding cuts to tolls in the suburbs. Something similar could apply here. Sting the bigwigs who drive into the CBD (and who do have an alternative) to help fund toll cuts on Eastlink and Citylink (at least, at off-peak times) which would benefit “battlers” travelling to and from suburbs with little viable public transport — as well as using some of that money to improve public transport, of course. Alan Davies keeps writing articles that cheer on petrol tax rises but keeps ignoring the fact that electric cars will kill that tax. I think you could charge 457 visa staff $10,000/year for car registration while leaving it at $700-800/year for the rest of us. Then you would raise revenue without angering voters. The statement that tolls are to “recoup investment costs on a specific part of the network” is incorrect. Tolls as they currently exist are to provide an indefinite revenue stream to the owners of Transurban and ConnectEast. That will colour future views of the merits of tolling. If the objective is to get more people to use public transport, then we need to do one simple thing. Introduce more public transport, especially in those void gaps. We are currently so short on public transport available, we could use the cliche of ‘if you build it, they will come’.